Good morning my positive friends. That was an uncomfortably comfortable win. Newcastle came and played a solid 541 formation that made creating chances very difficult, by 80 minutes we had only had 5 attempts. The problem for Newcastle was that their formation made creating a chance of their own, almost impossible. Leno really could have had a cigar on. Only making 5 chances ,until the second goal, might make you think that we were playing poorly, but that is far from the truth. We played a solid game with a good few moments of genuine brilliance. Mesut especially played some subline stuff. Ramsey , playing smack bang in center midfield, showed once again what a stellar player he is. He should have had 2 goals but Taylor derived him of the his opener. AMN has established himself as a more than competent understudy for the crooked Bellerin. Just about everyone, including substitutes , did a fine job, although I did feel Iwobi struggled. It wasn’t a great game of football, Newcastle made sure of that, but it was a very good win that puts us in 3rd position and builds a good head of steam for what has to come. We will have a much harder task against Everton on Sunday but with Xhaka back I think we will be fine. I’m convinced that if Emery simply picks our best players in their best positions, we can secure Champions League football. That will be looked upon, and seen as, a good first season for the new manager. However, the loss of Ramsey will still be a kick in the teeth. 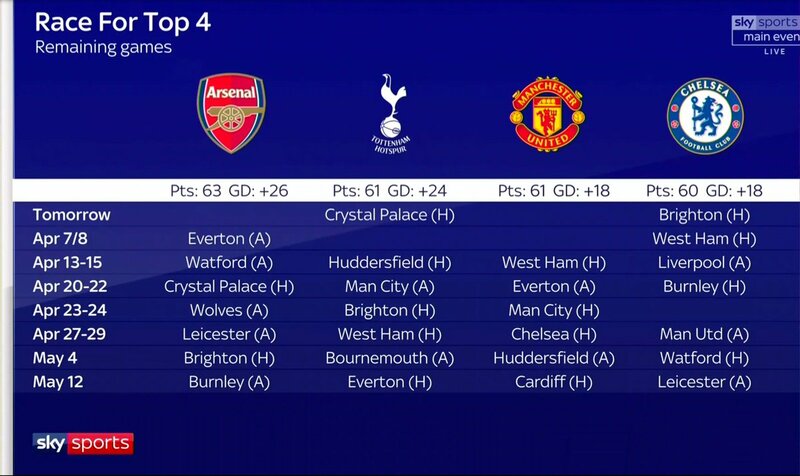 Apart from us obviously going on a winning streak until the end of the season we could also do with West Ham winning their remaining games against the top six teams, with them playing all our rivals their form could be important to us. Big thing for me is the number of hugely promising young wide forwards we have in youth ranks. Hate to use language of the know-it-all dweebs but, in my mind at least, likes of Amaechi, Nelson, Saka, and Smith Rowe, if used wide, have higher ceilings than Fraser. Guess we just have to wait and see. Guendouzi a huge exception but don’t think we’ve quite managed to push on any new youngsters behind Ainsley into first team this year. Puts extra onus onto next year to do so. Though in many cases maybe it can be deferred with a loan, if they sign up to contracts with us. Getting frigging nervous about Liverpool doing it now. Commentary in latter stages of game yesterday was grim enough. Bit hypocritical, or something, of me, as I suppose I should support a non-doper over massive dopers…but the heart doesn’t wants and all that. Maybe not the best one to decry their ref ‘luck’, as they had a strong pen claim ignored at key moment, and the offside was pretty close, but it really is astonishing how many offsides they’ve had this year. Lost count long ago, but there were claims it was an extraordinary number- double figures- a month or more ago. Impossible to calculate the effects of that, but it goes far beyond the goals scored themselves, and carries over into other games in terms of form, confidence, momentum, pressure. Been saying it for a while but the most generous interpretation is that whenever it is fairly close (and that covers a great deal of offsides) their instincts are always to guess that they’re on. Wouldn’t be a problem if that was the general, league-wide policy, benefit-of-doubt to attacker (if that still exists) and all that, but it simply isn’t. yeah Rich it seems the Refs have long bought into the soundbite that Liverpool’s name in on the title. Not at all surprised to see Paul Tierney who booked 3 AFC players in one game for diving, keep his card in his pocket when he waved away LFC dives yesterday. Also think he failed to book Salah for taking off his shirt in his goal celebration. It really is different rules for different teams with the PGMOL Game Managers. Arsenal U18 v Reading: T. Smith; Daley-Campbell, McGuinness, Clarke, Swanson; M. Smith, Azeez; Greenwood, Cottrell, Coyle; Balogun. Subs: Graczyk, Flaherty, Musah, Ogungbo, Matthews. Reading 0 Arsenal 3. Unsurprisingly, it’s Balogun again, who completes his hat-trick in 40 minutes. u18’s giving a lot of reason for optimism. The three talented young strikers- Eddie, Tyreece John-Jules and Balogun- raise issue for me of how far do you go to keep pathway open. For instance, talk now Danny may stay. For next year at least that means a totally different picture to if it were only Laca and Aubameyang for striker position/s. As it happens Eddie hasn’t been able to get many minutes as it is. With latter two I think they are too green at present to be playing much next year anyway, and, as Danny is such a likeable guy and good squad member ,no way I can be against him staying on. Point remains however that the difference between real opportunities for youngsters can be that one extra senior player. Next few years will provide all the answers I guess as to how determined we are to give youngsters a really good chance- optimum is understandably not advisable- to make it here. Reading 0 Arsenal 4. Balogun with his fourth goal of the game. our u18’s are now one win from winning the title, so need to win their final game in a few weeks time. Oddly the lads are off to the USA for the Dallas Cup, between now and final league game. Arsenal U18s beat Reading 8-0. Balogun with four goals. Azeez, Greenwood, Musah and M. Smith also scored. This is a sensational team. So apparently Spurs’ new stadium can only reach its 62,000 capacity during NFL games. They’ve built an NFL stadium to play in the premier league. This club continues to blow my mind..